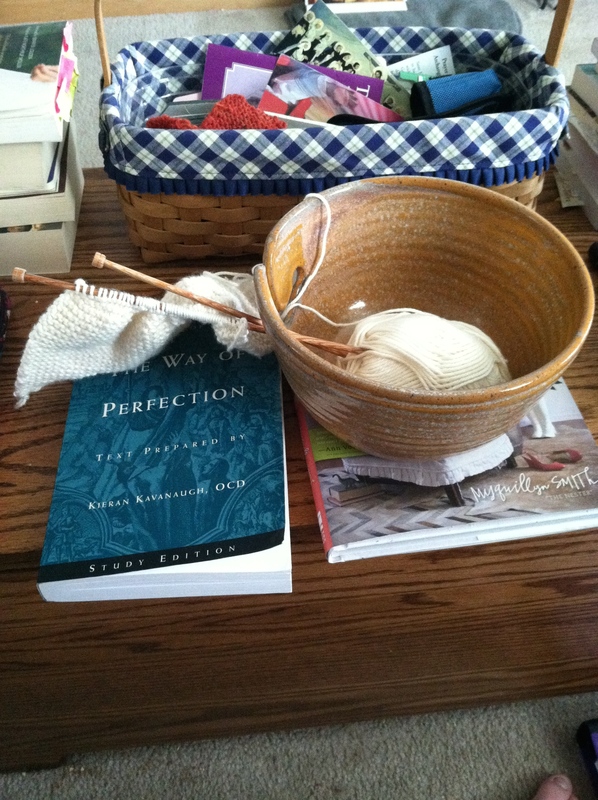 So Sarah, my lovely crafty friend, taught me a better way to cast on, and I love it, so I’m back to knitting. Since I’ve been away from it for a long time, I decided to start up again with basic projects and reacquaint myself with my needles, yarn, and stitches. I have several projects queued up, but I’m taking my time with these. So, the project I’m currently working on is a washcloth in garter stitch. I made a washcloth in stockinette stitch a while back, and I really liked it, so I decided that making another in garter stitch would be a great way to go back to knitting basics. The needles are sunstruck straight needles from Knitpicks, size 6, and the yarn is Knitpick’s comfy sport in white. I’ve also used fairy tale (in this same type of yarn). Let’s talk about the yarn bowl, OK? I love this! I got this beauty at the Inn at Cedar Falls gift shop last weekend, during a trip to Hocking Hills with my friends. Basically, a yarn bowl holds the yarn for you and spins it in the bowl, so you don’t have to worry about your yarn falling all over the floor or getting messy while you’re knitting. You can also feed your needles through the smaller hole when you’re not working on the project so they don’t run away. A lot of yarn bowls that I’d seen are expensive ($50-70 expensive) but this one was a very reasonable $25 and was made by a local artist. They had another at the store, and one of the owners told me she can’t keep them on the shelves, so if you’re in the area, go down and grab one! The book I’m reading is St. Teresa of Avila’s The Way of Perfection. I’ve read The Interior Castle several times before but never this one, and it’s been in my “to read” pile for awhile. Before I went on vacation last weekend I had an intense desire to read her, so I grabbed this book and added it to my bag. I’m about half way through and I’m really enjoying it. This chapter discusses devotions, in general (The rosary is next week 🙂 ). 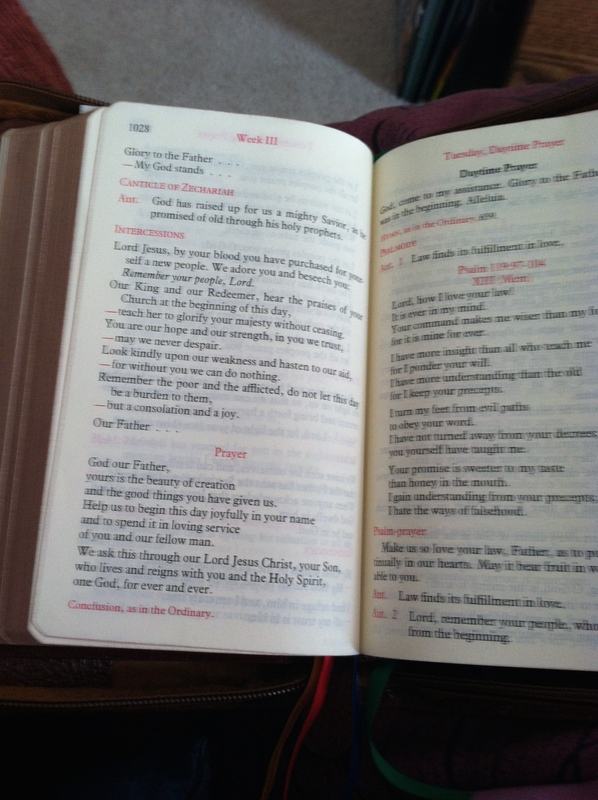 We’ve covered the Liturgy of the Hours and Lectio, so it makes sense to talk about general devotions. This is just a list of options/suggestions; by no means do you have to do them all. Monks and nuns don’t do them all! The Morning Offering, which exists in many forms (like this one and this one) , is a way of offering the whole day to God at the beginning of the day. When we say the “whole day”, we mean the whole day–these prayers usually contain some formulation such as “I offer you my prayers, works, joys and sufferings of this day”. If the day gets away from you, and you forget to pray for long periods of time, this is a good way to offer your day before it even begins. If you’re saying Lauds in the Divine Office, you don’t need to say an offering as well. These are both good things to do with children at the oratory, if you have them, or other family members, such as your spouse. Monday: The Holy Spirit, the Souls in Purgatory. Wednesday: St. Joseph. He represents fatherhood, care, protection, a happy death, and sanctified work, and is the Patron of the Universal Church. Friday: Christ’s Passion and the Sacred Heart. A way to work these in–you could, for example, pray a decade of the rosary for the Souls in Purgatory on Monday; say a prayer to St. Joseph on Wednesday; make a holy hour on Thursday, if at all possible, etc. January: The Holy Name of Jesus, which is celebrated on January 3. March: St. Joseph, whose feast day is March 19. The Litany of St. Joseph can be said on each of the seven Sundays preceding his feast day. December: The Immaculate Conception, which is also a Holy Day of Obligation in the United States, celebrated on December 8. And finally, if you have saints’ name days to celebrate, or family feast days, do it! For example, as a Dominican I celebrate the feast days of our Dominican saints, especially St. Dominic on August 8. My middle name is Michele, which is derived from St. Michael, so I celebrate his feast day on September 29 as my “name day.” My confirmation saint, St. Therese, is celebrated on October 1. There are many ways to celebrate the saints of the church and our various devotions. The key is to find what ones you love and what works for you and your family. It’s cloudy, it might rain. It’s very cool–about 75 or so, I think–which is really cool for Ohio in July! But I’m not complaining. Jeans and a blue v-neck t-shirt. Rehab is going well. I sort of had a meltdown yesterday about the inability of my body to do what I want it to do, but my therapists were very understanding and we talked about how no one can do things right off the bat, and we work toward things with modifications, adjustments, etc. Rome wasn’t built in a day and all that. Then I went and did 5.5 miles on the stationary bike, which is a personal best for me. So yay body. This was also because I went to Hocking Hills with my friends over the weekend, and my body can’t do things theirs can do, like do 4 mile hikes (uphill, yeah, no), and do other things. I just can’t. And it’s really frustrating to be sitting out and watching people do things I wish I could do. People really don’t understand what it’s like to want to do things and have a really uncooperative body. Some people are more sympathetic than others. But, in general, there was some “I hate my body” happening, but I’m trying to get past that. The first draft of my memoir is DONE!!!!! And sent to Cristina, my very first lovely reader!. And I’m knitting again! Yay! I finally learned a better cast on and it’s helped me immeasurably. 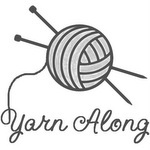 So we’re doing Yarn Along this week! YAY!!!!!!!! CCD rapidly approaches. I can’t believe it. I’m really excited to meet this year’s crop of kiddos!! And I miss teaching so much. There’s a Dominican Rite Mass at my parish on Sunday (8/3) in honor of ST. Dominic’s Feast on 8/8. It’s going to be AWESOME, and afterwards my Lay Dominican chapter is going out to dinner. We also have our annual Day of Recollection in August, which is always edifying and exciting. And we’re getting a new friar next month, because Fr. Gregory is going to Oxford to do some advanced studies. I am jealous, and I will miss him muchly. Still digging out from the show and vacation. Whew. It’s crazy over here. Veggie stew tonight and then some other goodies–meatballs, turkey burgers, etc.–later this week. This is from my sometimes active cooking blog. I love this salad, and you will too! This isn’t just for summer. I mean you could make it any time. But summer strawberries are much better. This is the only recipe I have created MYSELF, thus far. So this is an Emily Original Culinary Creation. Like most good things, this was created sort of by accident. Last week’s post was a big one. This week is no less big, but only deals with one book: The Bible. Yes. That book, you know, that you have and may not have opened, ever? That your godmother gave you for First Communion or your sponsor gifted you at Confirmation? Or maybe you got it for your wedding? You have it, and you think it’s a nice book, but you’ve never actually cracked the cover? I know a lot of people (myself included) have tried to read the Bible straight through, only to get discouraged around Leviticus. That’s OK. The Bible isn’t a continuous story–it’s a lot of different books that are written in different styles. You don’t have to read it in a linear fashion. 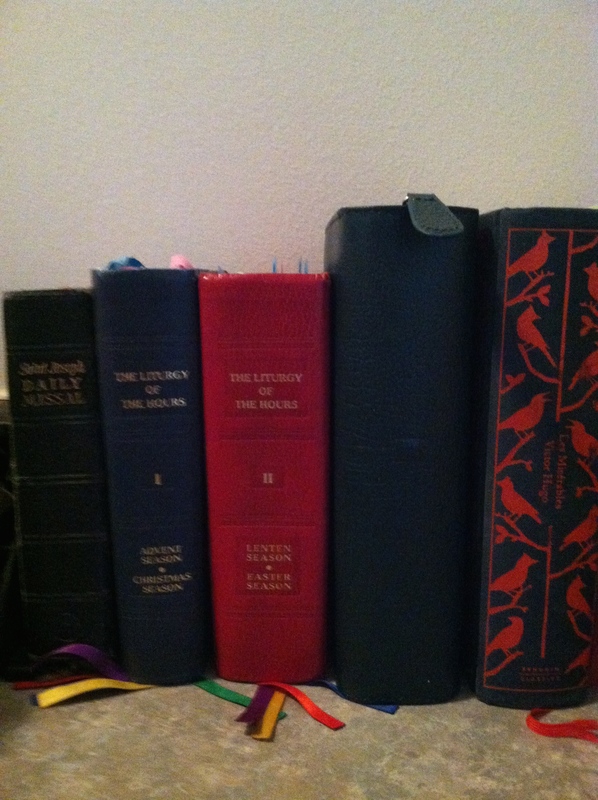 So let’s turn to The Little Oratory and see what it tells us about reading and praying with the Bible. 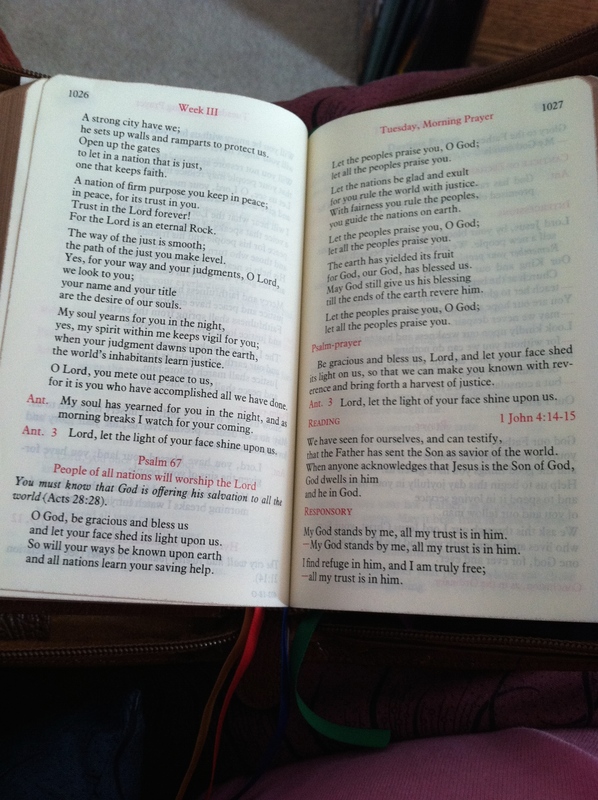 A great wade to wade into reading the Scriptures is to focus on the readings from Mass. Magnificat magazine, which I adore, has the daily readings and other devotions in a portable monthly format, or you can go to the USCCB’s website for the daily readings. By reading the readings for Sunday ahead of time, we allow ourselves to become familiar with what we’re going to hear, and allow it to sink into our minds, perhaps inspiring prayer or other meditations on what we’ve read. A formal way of reading scripture is lectio divina (“holy reading”). This is when “The Word of God is so read and meditated that it becomes prayer [and] is thus rooted in the liturgical celebration.” (CCC 1177) This has several parts. The first thing you want to do is get a Bible in a beautiful and approved translation, as the authors of LO suggest. Once you have it, there are four parts to lectio. Oratio/prayer: Talk to God about what you’ve read, ask for help in certain areas–whatever your reading has inspired in you. Contemplatio/contemplation: This part is more receptive (83). “It is a state of stillness of mind, of just being with God.” (83) It won’t always happen, and that’s OK. We don’t have any control over that part. I generally read 2-3 chapters of the New Testament daily. That’s my current reading plan. I use the Ignatius Catholic Study Bible New Testament and the C.S. Lewis Bible. I read and I don’t always feel great stirrings of the Spirit. But that’s OK. The important thing is to develop the habit of lectio, of reading God’s word and letting it sink into your mind and heart. At first, I know–the LOH can seem crazy complicated. You get this huge book (or books, if, like me, you have the four volume set), and it’s got all these parts and colored ribbons and how do you know where you’re going and what is happening?! 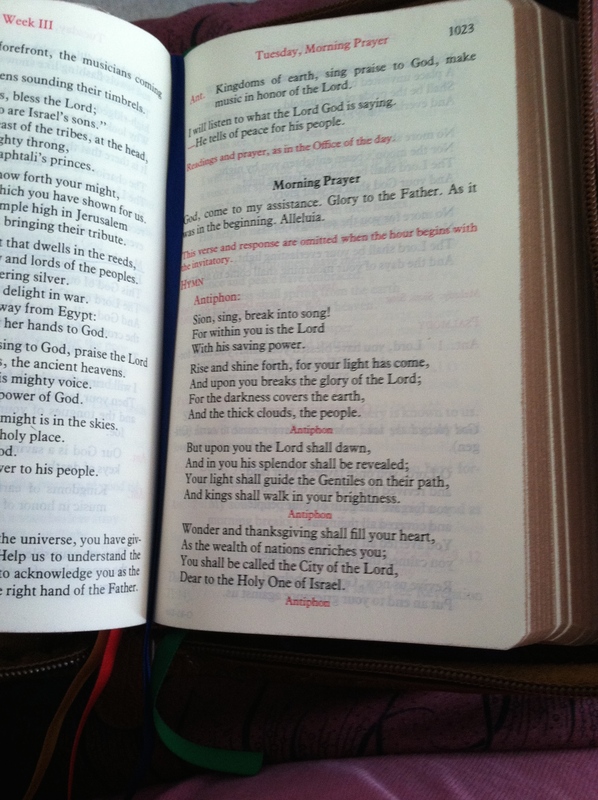 Three psalms and canticles. Usually two psalms, one canticle. What makes it confusing is….what precisely goes in those eight parts. The best way to learn to say the hours is to have someone teach you. That’s how we do it in our Dominican chapter; the office is one of the first things inquirers learn to do, in an hour long class dedicated to it. It’s also helpful if you have the book in front of you. But I’m hoping my pictures will give you some idea! This is the current LOH book. I use the 4 volume set. This is the third volume, for the first part of Ordinary Time (the second one is green). You can use these to mark different parts of the book. Everyone has their own way of using the ribbons. 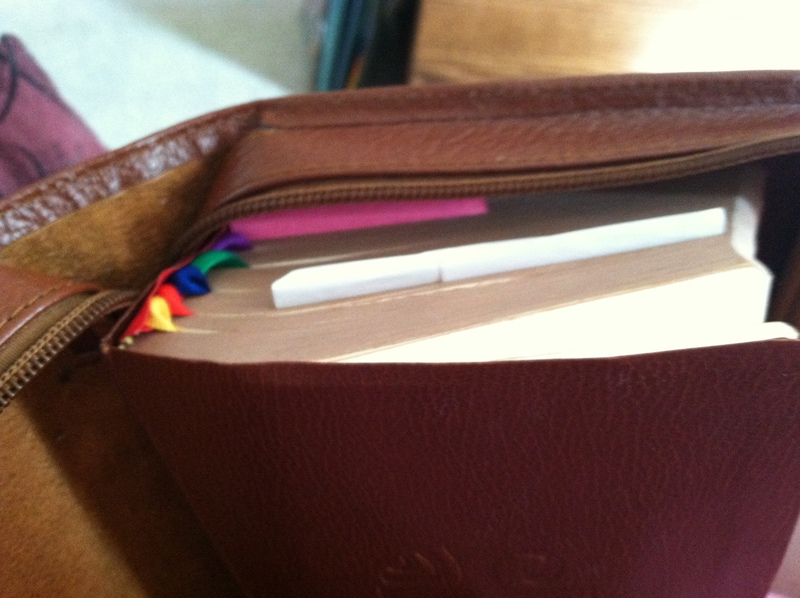 I use mine to mark the Office of Readings, the morning canticle, the current day in the psalter, and feast days. There’s a hymn. This is optional, but if I know it, I like to sing it. 🙂 During Advent/Christmas and Lent/Easter there’s a section of appropriate hymns in the beginning of the book as well. The psalms/canticles. 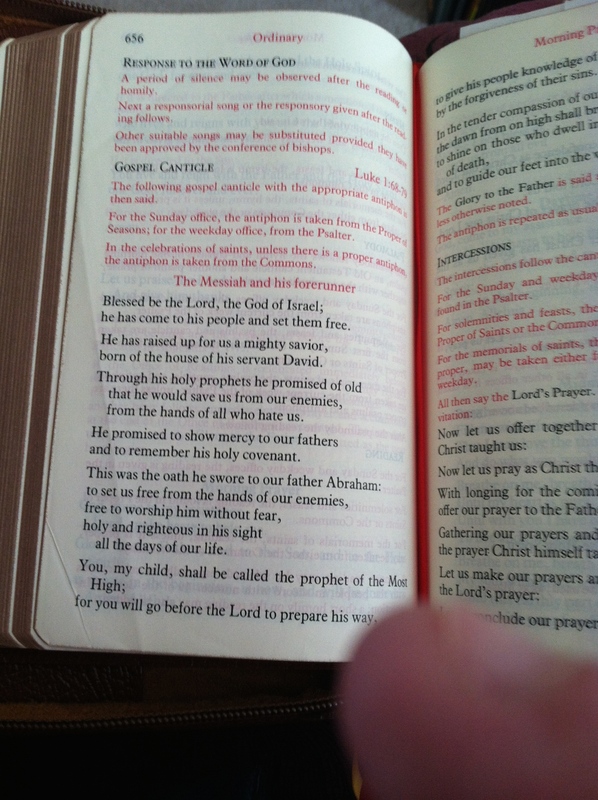 In the book above you see the end of the canticle, the last psalm, the reading, and the responsory. 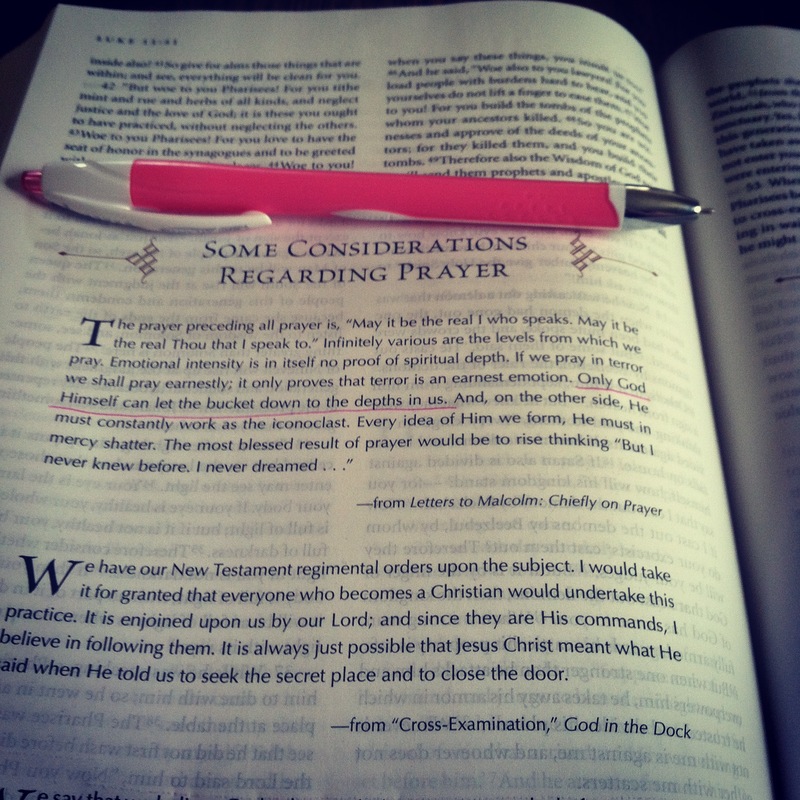 Then I flip back: Intercessions and closing prayer. The cycle is roughly the same for evening prayer as well. 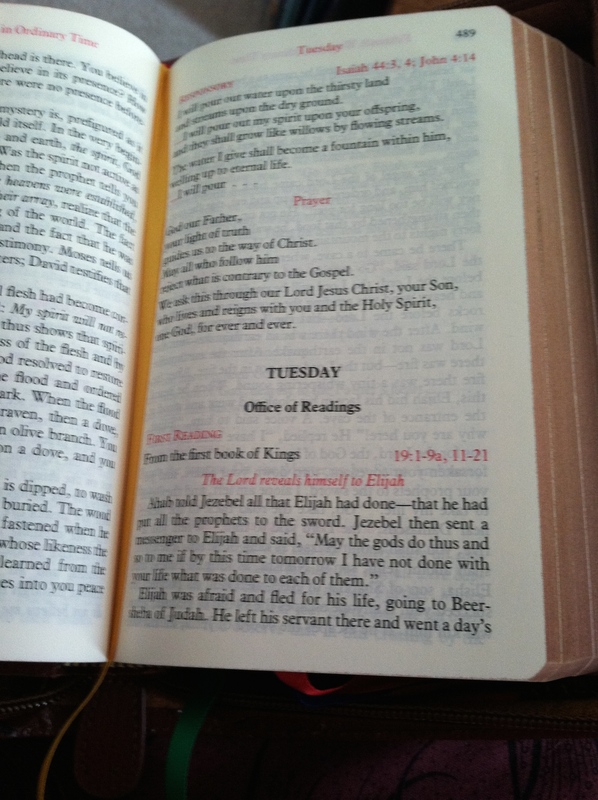 For Office of readings, it’s three psalms, then the readings. You have the saint’s name in bold under the date. The red notation underneath tells us what it is: A feast, a memorial, whatever. St. Bonaventure gets a memorial. There’s a short paragraph about the saint. Then see that red writing? That’s where the prayers for today come from. 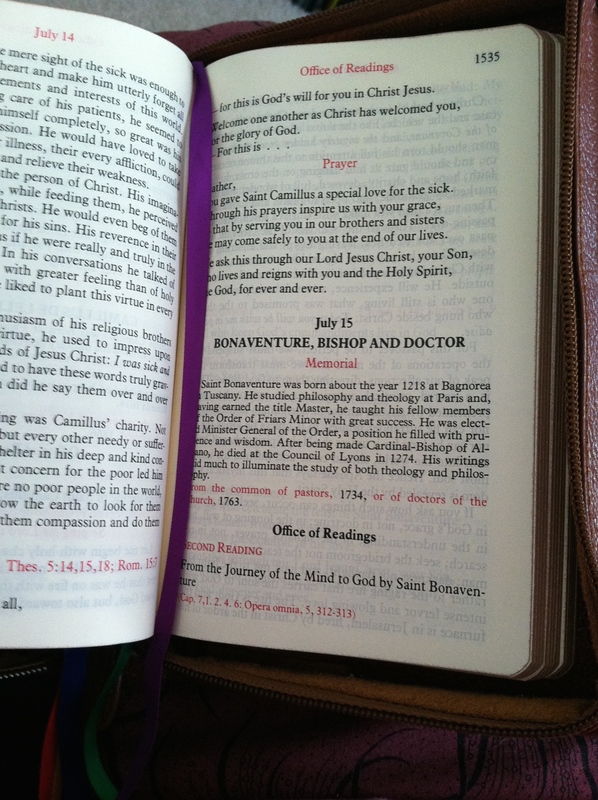 Since St. Bonaventure is a Doctor of the Church, he’s really complicated. Doctors the Church are the most complicated, I think, because you have two different sorts of things to juggle. But usually it would just say “Common of Virgins” or “Pastors” or whatever. There you get antiphons, etc that are particular to the saint. After that you see Office of Readings in bold. Following that is the second reading proper to the feast. So instead of reading whatever the second reading is for Tuesday, July 15, I’ll read this. 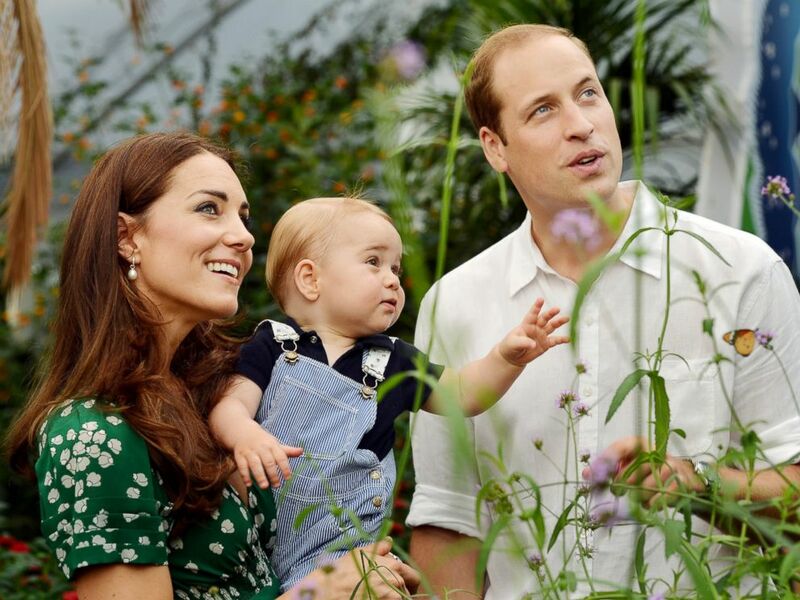 For complicated feast days, you can use divineoffice.org, which I love. Also, if you get lost in where you are in the office, this site will tell ya.